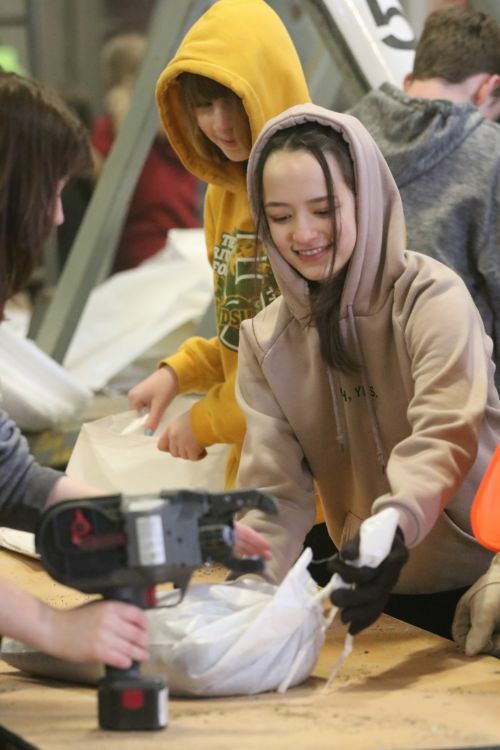 FARGO – Round one of Fargo’s Spring Flood 2019 fight went to the volunteers, many of whom were middle school students. 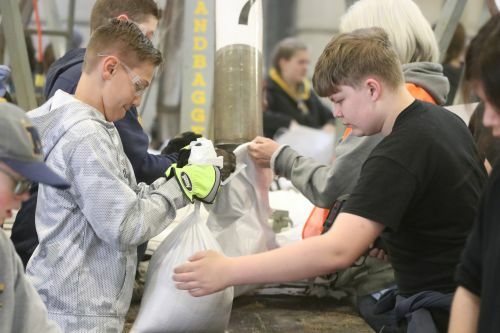 Helped by two large sand-dispensing “spiders” – a tactic used during the 2009 flood to speed up production – mostly eighth graders produced more than 15,000 sandbags Tuesday morning. 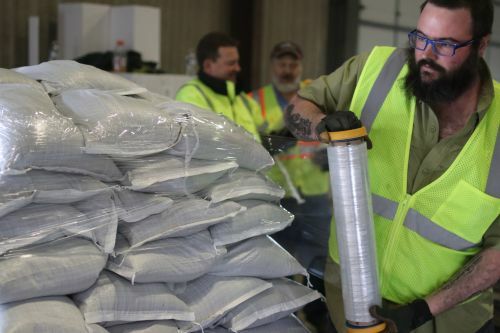 Rock music mixed with dust, the heavy droning roar of conveyor belts, forklifts, and backhoes added a sense of excitement to Fargo Sandbag Central on the first day of the city’s plan to fill one million sandbags before the end of next week. 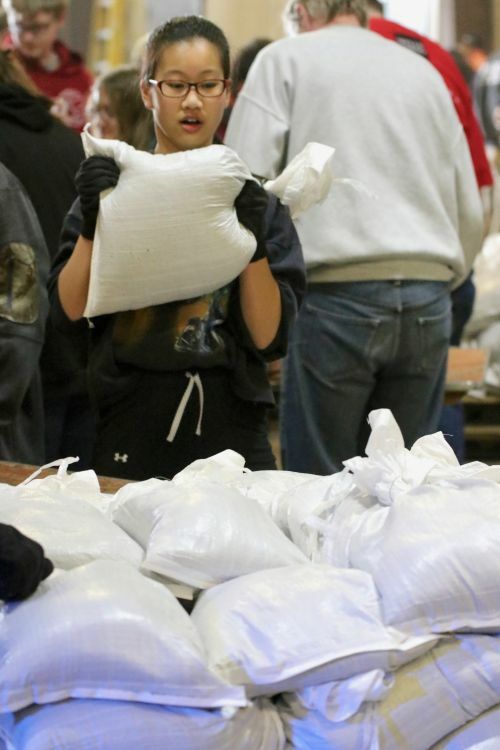 Mostly area schools and some companies have scheduled in shifts to volunteer, Assistant City Planner Mark Williams said. Mornings are filling up quickly leaving early afternoons and evenings still open, Williams said. Despite road signs saying no parking until April 15, parking is allowed on both sides of the Great Northern Road, Williams said. 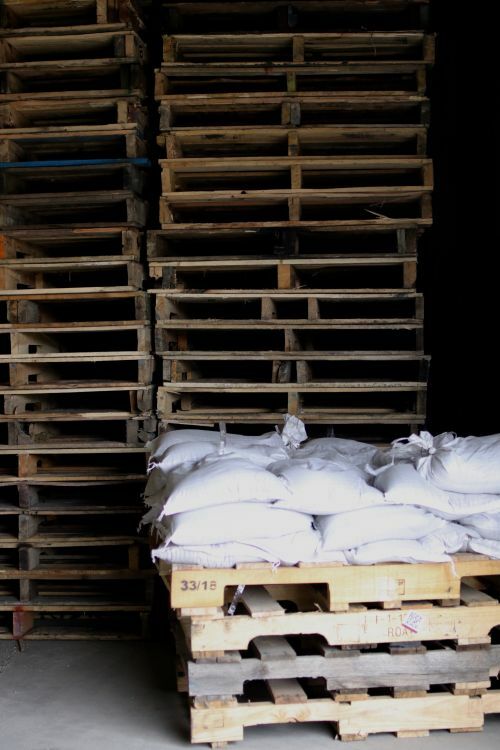 The city’s preparations are not overkill, he said, even if the flood doesn’t reach the 10 percent prediction of 40.3 feet. Fargo Mayor Tim Mahoney stopped in shortly before noon, wanting to thank the students for their work. “We love the energy the kids bring, it’s always fun,” Mahoney said. The city’s first day was difficult, Mahoney said. A bearing broke. Some of the firemen are new recruits and weren’t familiar with the process. Problems were fixed, and machines and humans were humming along at a steady pace, he said. Once the FM Diversion is finished, there will no longer be a need for sandbagging, Mahoney said. Doanld Voeller is 80 years old, going on 50, he said. 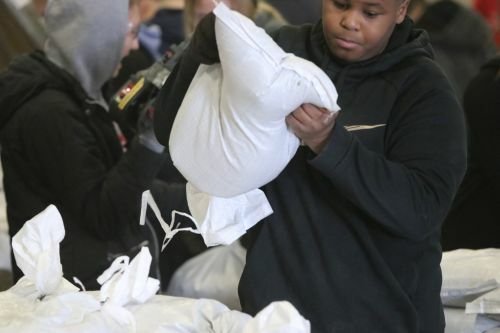 He hefted sandbags easily as a teenager. 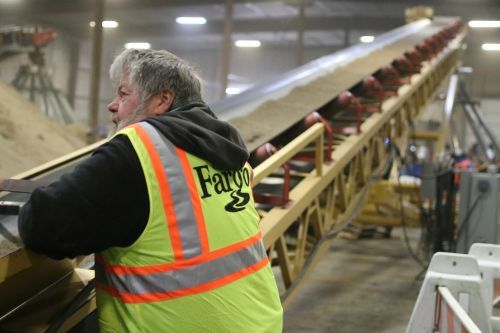 Living in Fargo since 1965, he has seen floods before and doesn’t believe this year’s flood will reach the predicted 10 percent levels. Voeller joked with volunteers while he worked. 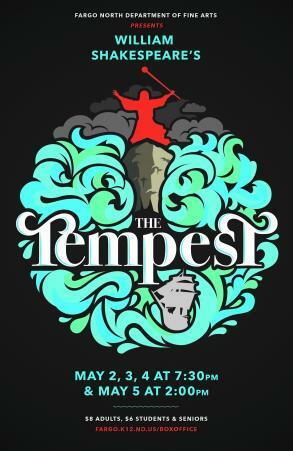 Josh Simpson, from the Twin Cities, is a sophomore at North Dakota State University. 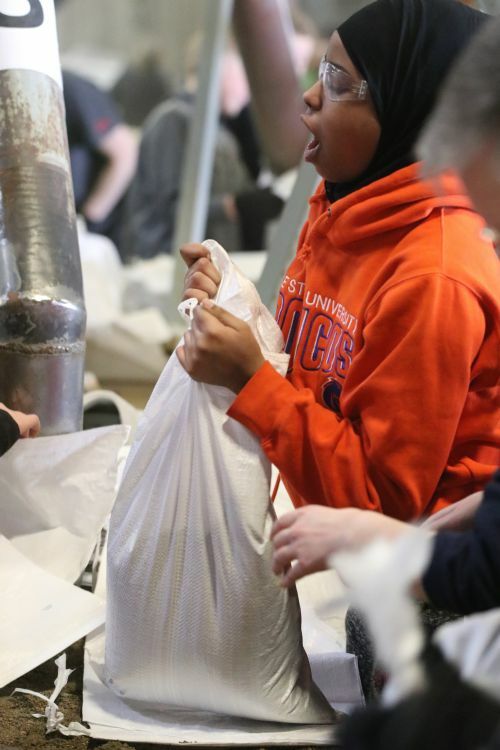 He has never seen a citywide flood before, and decided to volunteer his time. “I know how damaging flooding can be, so I figured if I could help prevent it, I would,” Simpson said. 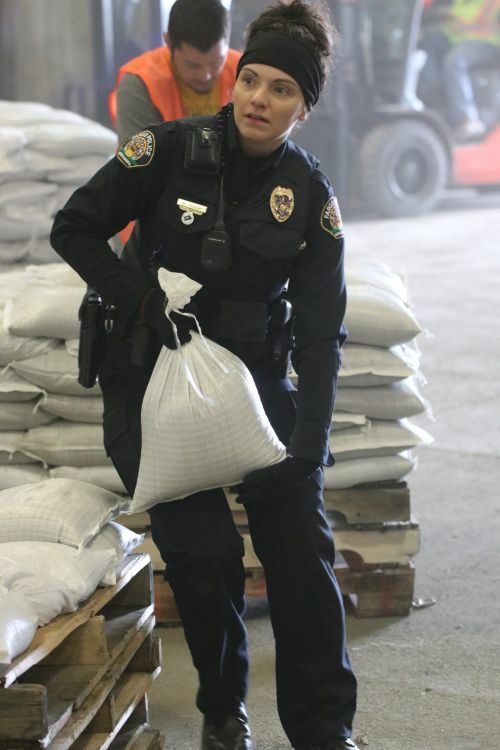 City of Fargo employee Dylan Sherwood was responsible for wrapping completed sandbags in plastic before the pallets were loaded onto 18-wheelers. 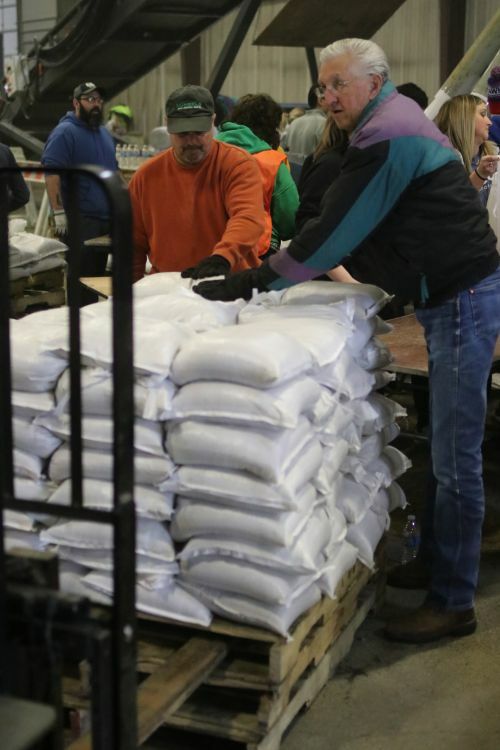 He usually works at the wastewater plant, but will be at Fargo Sandbag Central all week, he said. He’s not worried about a flood, he said. “The city does a great job of planning,” Sherwood said. 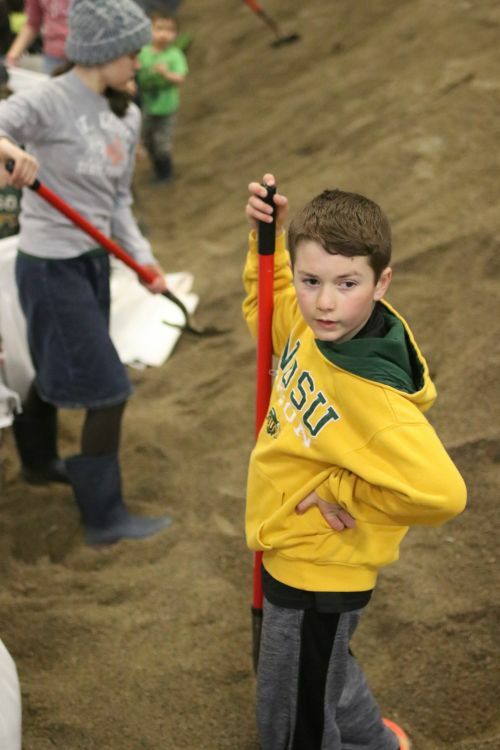 Micah Winje, a pre-teen, was with family shoveling sand into bags – the old way. Living in West Fargo he said his family’s home is protected by a diversion, but he’s worried about other people. Salvation Army volunteer Sharon Menge was working the refreshment area and said this year the fight is much more organized than in year’s past.